Google’s search algorithm always offers the most accurate and relevant organic search results. Using its now infamous PageRank formula to assess the quality and quantity of content and links, Google has categorized and cataloged the better part of the internet and has always produced accurate search results, no matter how many times it was used. This made both the corporations and individuals realize the intrinsic power of organically appearing at the top of a search results page, and that’s where things started to change. Some shady characters were very adamant in playing the system, which isn’t that surprising once you understand exactly how much money was in stake to appear top and center in the search results. This led to the creation of gigantic content and link farms which were used to auto-generate links and spin low-grade articles in order to secure that top position. To combat these underhanded efforts, Google had started implementing numerous adjustments to the ranking algorithm aimed at weeding out the scammers and fine tune the semantic search, a practice which persisted to this day. Enter 2016, a year in which Google has made some of the biggest changes and updates to its ranking system. With new updates came new search engine optimization guidelines and practices, most of which we’ll be discussing here. People seem to either misunderstand SEO or have unrealistic expectations of what it can do. They expect to do as little work as possible and get the biggest initial return, and SEO is all about doing the most work for a low initial return. It’s a slow process which doesn’t pay off at first but shows real results based on the consistency of work and quality of content. 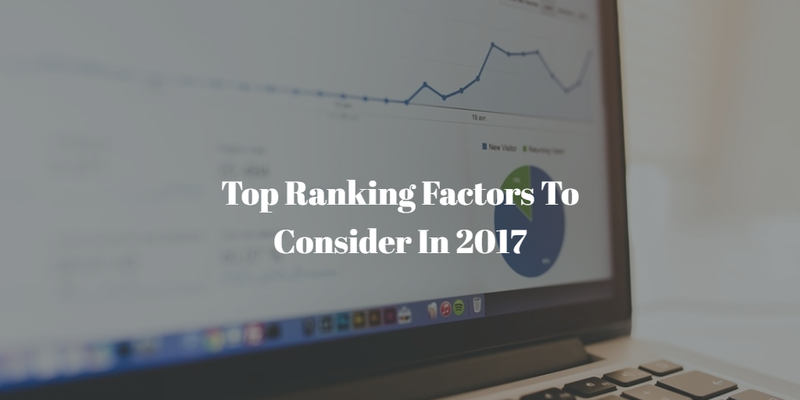 To elaborate further, here are some of the top ranking factor you should consider in 2017. Nothing signifies authority in Google’s eyes like a healthy link profile. This doesn’t only mean that you need to have good, quality links on your website, but those links need to connect to quality content. Having websites link to your domain is important, but those links have to lead to quality content, or else it will have an adverse effect on your ranking. Not only that but the links should preferably be IP-diverse, which means they should not come from the same identical source. The last component of profile authority is the velocity with which those links are created, as Google prefers a steady increase over time instead of cramming them all in one day. Having a good, user-relatable content has been one of the staples of ranking since 1996. Since then, all the major search engines have been trying to rework and refine their search algorithms to reward good, relevant content. This means that content filled with grammatical and structural errors, as well as spun and duplicate content only lower the overall ranking of a website. The best content doesn’t only have to be of substantial length but also needs to be well-written, engaging and keyword centric in order to attract readers into spending a significant portion of their time to consume and digest said content. Although responsive design has been around for quite some time now, it’s safe to assume that more and more brands and business, both small and big, will focus on turning their online presence into a responsive one. This is due to the fact that more than half of all internet traffic has become mobile and having a single website which fairs well on both smaller devices and large desktop screens are slowly becoming a norm. People tend to switch browsing between platforms, so having the same, fluent user experience across all platforms is something Google’s ranking algorithm prefers over sloppy and mobile-unfriendly design. The name says it all. This is a web development practice in which the design process starts with mobile devices in mind and get built-up for larger screens. As mobile devices are becoming the primary means of internet browsing, having a website which doesn’t work well on mobile can only lead to poor ranking. Google is so focused on improving the mobile browsing experience that they’ve launched the AMP, or Accelerated Mobile Pages project, which a way to build web pages for static content which renders quickly on mobile. These relate to all the pages a website has to have and how those pages should behave in order to be ranked in the top of the search results page. Google gives a higher ranking to websites which contain a high number of relevant pages, contain “about us” section and categorize content into proper categories and menus in order to ensure relevant navigation within the site. Another important aspect is the privacy page and the TOS. Websites with transparent policies will always get ranked higher than those who lack concrete terms of service and in turn, appear less trustworthy. Sites with a Sitemap are also easier to index and as such, have a higher priority over those without it. A sitemap represents a list of URLs and additional metadata about those URLs which search engines use to crawl a website more efficiently. The last factor in this section is the website uptime, as Google ranking generally looks down on websites who suffer from downtime constantly and reports have stated that some websites with fairly poor uptime have actually been removed completely from the search results. To put it simply, Google doesn’t trust new websites. This trust is built upon, by providing the users with quality content they can view no matter what device they use. The content needs to be relevant, void of any errors and somewhat lengthy in order to be picked up by the algorithm. The site itself should be responsive at the very least, with quality links branching from and to it. These are all good SEO practices, and if you think that you’re way over your head with this one, then you might want to consult a professional practice to help you get your website at the top of the search engine results page. Author bio: Sam Cyrus is CEO and co-founder of Algorithm SEO Agency based in Sydney, an innovative online marketing agency based in Sydney which is focused on Digital Marketing. Sam is also a creative writer and his interests are entrepreneurship, business, online marketing, SEO and social media.